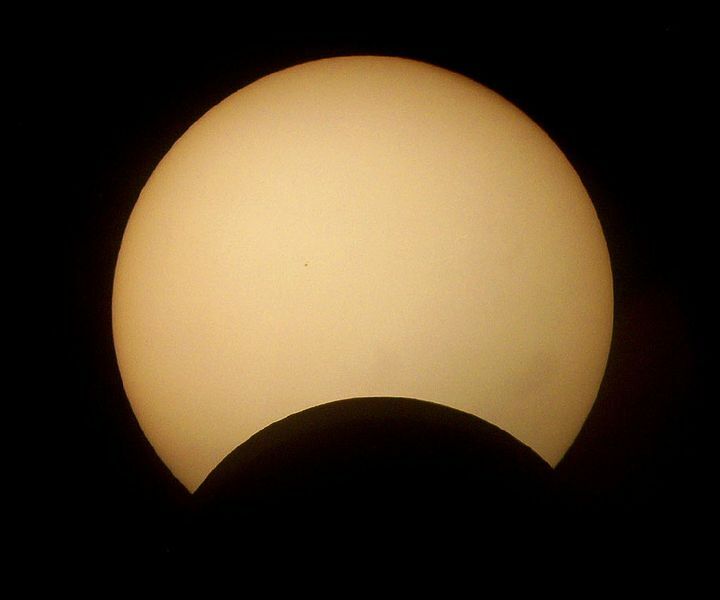 Tomorrow most of the western United States and Canada will experience a partial solar eclipse. For the northern US and Canada the Moon will block up to 90% of the Sun, while for other regions it will block much less. You can find out more about this eclipse, as well as when to check it out here. I’ll add the standard note of caution that you shouldn’t look at the Sun directly during an eclipse. You should either use eclipse glasses specially made for safe viewing, or make a simple pinhole camera. This particular eclipse won’t be seen as a total eclipse anywhere. To see a solar eclipse on Earth, the Moon must pass in front of the Sun from our vantage point. If the orbit of the Moon were exactly in line with the orbit of the Sun, then we might expect a solar eclipse once a month. But the Moon’s orbit is tilted about five degrees relative to the orbit of Earth, and this means that the Moon is often slightly above or below the Sun from our perspective when it passes between the Sun and Earth. So most months there is no solar eclipse. Not all solar eclipses are alike. Since the Sun is larger than the Moon, there are regions where only part of the Sun is blocked by the Moon, and the resulting shadow is called the penumbra. For a much smaller region where the Sun is completely blocked by the Moon, the shadow is called the umbra. The type of eclipse you observe depends in part on whether you are viewing it from the umbra or penumbra. In this case the Earth will pass within the umbra of the Moon, so it is only a partial eclipse. If you happen to catch this eclipse and are waiting for a total one, you won’t have to wait too long. Make plans for August 21, 2017. On that day a total eclipse will cross the US from Oregon to South Carolina, making it within a day’s drive of most of the country.